Jay Whittle looks at the social media reaction following Wigan Athletic’s 4-2 defeat at Sheffield United on Saturday. Billy Sharp scored a hat-trick as Latics’ misery on the road continued at Brammall Lane. 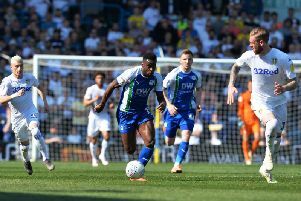 Chey Dunkley unfortunately diverted former Latics striker Leon Clarke’s off-target shot into his own net in the 23rd minute. Kal Naismith, who was brought on to replace the injured Gary Roberts in the 36th minute, made an instant impact by scoring the equaliser just three minutes later with a composed finish from Nathan Byrne’s right-sided delivery. ButBilly Sharp fired home from close-range to restore Sheffield United’s lead before the interval. Sharp, who now has reached double figures for goals this term, notched his second goal of the afternoon shortly after half-time, before completing his hat-trick on the hour mark. Substitute Joe Garner did pull a goal back for the Latics in the 69th minute to spark temporary comeback hopes, but it proved to be merely a consolation as Wigan fell to their eighth away defeat of the season at Brammall Lane. Wigan fans vented their frustrations on social media after Paul Cook’s side slumped to yet another defeat away from home. Sheffield United fans praised Paul Cook’s side for their performance at Brammall Lane after they admitted that it was refreshing to see a team try and win the match rather than sit back and hold out for a draw.